If I think about last night’s crossover episode of The Flash for approximately more than five seconds, one of two things happens. I either realize that much of “Duet”, from its premise to its villain to its character arcs, was flying by at the speed of Barry Allen on the seat of its pants. Or I remember it was so fun that I totally don’t care. It’s very clear that “Duet” was an intense undertaking for The Flash, which is kind of amazing for a show that flits between speed-punching Gorillas and time travel nonsense every week. But even then, wrangling in cast members from three different shows, writing original music, and setting up big dance numbers is a daunting production task, but the show pulled it off. It wasn’t perfect, because neither the episode’s premise nor its ensuing plot were particularly cohesive, but in the end it was all held together by sheer glee—both the emotion and the show of the same name, given the trifecta of former Glee stars Darren Criss, Grant Gustin, and Melissa Benoist. Take Criss’ Music Meister, for instance, who showed up in the last five minutes of Supergirl the night before for no real reason, then came over to Flash to do much the same. He goes from making dream musical worlds, to being able to absorb super powers, and then goes and robs a bank just because, and by the end of it, he’s basically an intergalactic cosmic matchmaker from the Fifth Dimension in the style of Mr. Mxyzptlk and then dances off stage left (which have been more interesting if Supergirl hadn’t just had Mxyzptlk on the other week). There’s no real motive or clear intention for his presence other than to force the musical episode into existence. There’s also the artifice that Barry and Iris’ relationship drama, which have made Flash a dreary watch outside of the aforementioned gorilla-punching lately, was confirmed as being introduced specifically just so this episode could involve Barry sing-proposing in its climax. The episode totally earned that moment, mind, because Grant Gustin blew the proverbial socks off me with his solo song (penned by La La Land’s Benj Pasek and Justin Paul), but it’s sort of like shooting yourself in the foot and then garnering applause for neatly removing the bullet and bandaging yourself. The same couldn’t really be said for the similar attempt to reconcile Mon-El and Kara’s relationship woes this episode—which definitely didn’t feel as earned, meaning Supergirl will go back to Earth-38 and still have its Mon-El problems. This all might sound like I didn’t like “Duet.” But oh, dear reader, it was actually so much fun that all of the above complaints don’t bother me in the slightest. The Flash is at its very best when it just rolls with as having as much fun as possible, and can poke fun at itself at the same time. The power of love and how music can cheer us all up aside, that’s what this episode was really all about. Grant Gustin and Melissa Benoist’s chemistry together is simply electrifying—best exemplified by the joyous “Super Friends,” penned by Crazy Ex-Girlfriend star Rachel Bloom, a bouncy little number about mocking Superman and the fact that Barry isn’t allowed to time travel anymore because he’s a dork. The whole cast is on fire throughout, and the sheer fun they’re is having while goofing around in this alternate West Side Story-ian escapade just oozes off the screen. It’s supremely silly, and a lot of the love for this episode is going to be predicated on how much concentrated cheese you can endure, especially when it involves people randomly breaking out into song. But if you’re fine with that—I mean, no offense, we’re all watching The Flash so I have to assume we’re all fine with it on some level—“Duet” feels like one long, sing-song extended joke that the audience is in on just as much as the actors involved are. If I actually had a regret for this episode, it’s that in a perfect it world it would’ve been a two-parter to let all the stars get a true chance to shine with a song (I need way more “Jesse L. Martin and Victor Garber as gay dads” duets in my life), and maybe actually let Supergirl be a more prominent player in these crossovers. But what we got—two excellent original songs and three fabulous covers—still shone. It says a lot that the casts of the Flash and Supergirl, their powers combined, can get away with so much solely on their charm and chemistry. But it also means that last night was one of the most joyful and fun hours of television I’ve seen in a while, flaws and all. Honestly, my biggest problem with it is that I have to wait until work is over to watch it again. Folks, I can’t tell a lie: this Assorted Musings section is solely here so I could squee over every little face every damn member of the cast on this show pulled last night. So much fun. Caitlin’s reaction to J’onn transforming when she walks in. 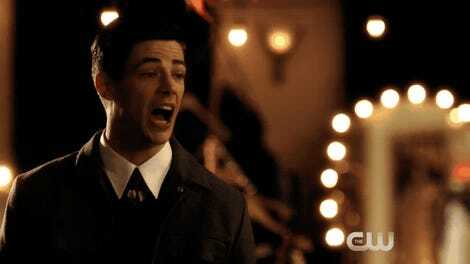 Barry’s face when he’s first whammied and hears Kara’s singing voice. Barry again, when he realizes Joe and Stein were going to sing together. Barry, again, getting so caught up in Music Meister’s “Put a Little Love In Your Heart.” he starts involuntarily squirm-dancing. Winn, all the time. CW’s DC shows are not exactly known for their emotional subtlety, but the deftness with which this whole team wrung every moment of this hour dry for a laugh was nothing short of sublime. The moment we find out the star-crossed lovers of the musical story were Iris and Mon-El. I mean, it was obvious—of course it’s them!—but god, I cackled anyway. Speaking of which, I’m pretty sure if you opened up a dictionary right now and looked up the word “moxie,” Candice Patton’s accent in this episode would be the sole example. It was so terrific it almost made up for the fact she didn’t get to sing. I’m super impressed that Barry’s phone at the end has speakers good enough that all he needs to do is set it down on the table and get a perfect backing track for his solo song. I assume Cisco mucked about with it at some point to make it a super Star Labs phone or something. If I had to rank the songs—which is almost impossible because I loved all of them—it’d have to be “Super Friends” > “Runnin’ Home to You” > “Moon River” > “More I Cannot Wish You” > “Put a Little Love in Your Heart”. Please share your definitive rankings in the comments.